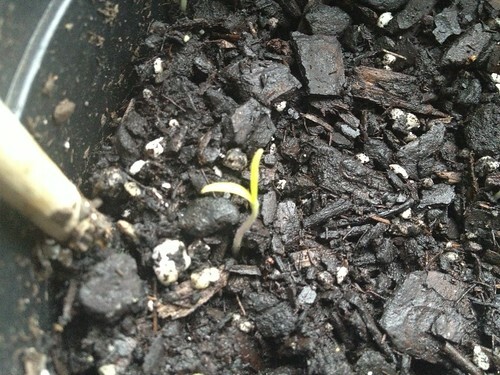 My first tomato seedling popped up! It's just a little one compared to some of the other seedlings I have, like this bean: Which actually just popped up yesterday too! Such a nice, strong stem, little bean. And these are little broccolis. I planted eight seeds and there are seven seedlings which is pretty good, if you ask me. My first two years of starting seeds I always planted many more than I needed because I was afraid lots wouldn't sprout or that I'd kill some once they did. 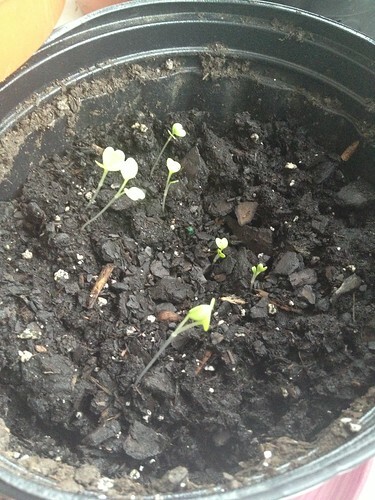 That never really happened and I just ended up throwing out all the little seedlings I didn't have space for. This year I actually made a plan for my garden and figured out how many plants I have space for. I still planted a few extras, just in case - I really only have room for two broccoli plants - but if I only have to get rid of five extra baby plants instead of 20 I'd say that's an improvement. And then we have mustard greens - three kinds. 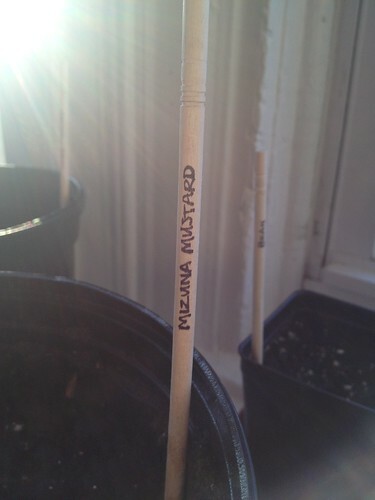 Again, I only have room for a few plants of each kind of mustard green so I only planted a few seeds for each. 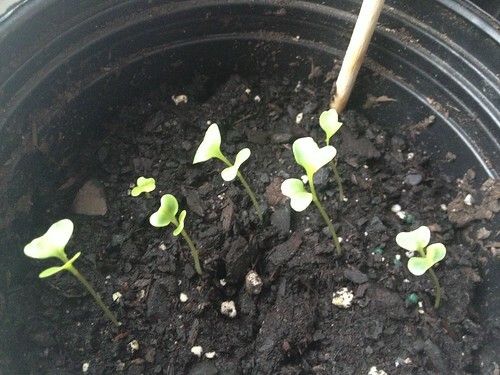 I'd like to note here that the broccoli seeds are from 2010 and seem to be fine. I keep my unused seeds in a paper bag folded over and taped shut (for darkness) in one of the drawers in my fridge, away from any food. The tomato seeds are saved from last year, too. So I must recommend this method of storing seeds. Lastly, I found myself with an abundance of wooden chopsticks - the kind you get with takeout Chinese food, which is strange since we don't order Chinese takeout very often. I don't know why I didn't do this earlier, but obviously their secondary purpose - after utensils, of course - is as plant markers! Duh, Sarah. Above is an embarrassing photo of my garden "plan." For my birthday next month my father has agreed to build me a raised bed for the sunny part of my backyard! Thanks, Dad! I measured it out and decided that 3'x10' would be a good size for the space, against my neighbor's wall that he has graciously allowed me to attach a trellis to. So the beans and tomatoes will have something to grow on! 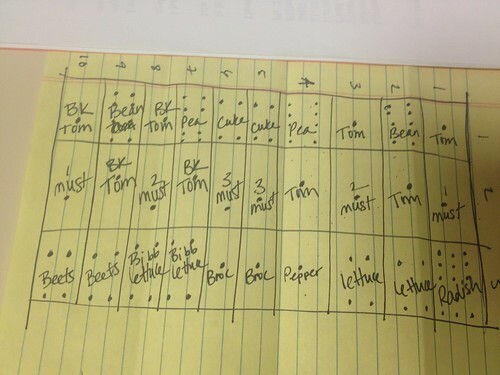 Then I did something strange - I looked up each plant in my copy of Square Foot Gardening to figure out how many plants I could reasonably fit. No more crowding as many tomatoes in as possible! (And note that you're supposed to plant ONE tomato plant per square foot which is definitely not what I was doing in the past.) If I do end up with extra plants, which I most likely will since I planted a few extra seeds each, I can still grow things in containers around the raised bed. Happy spring, everyone! 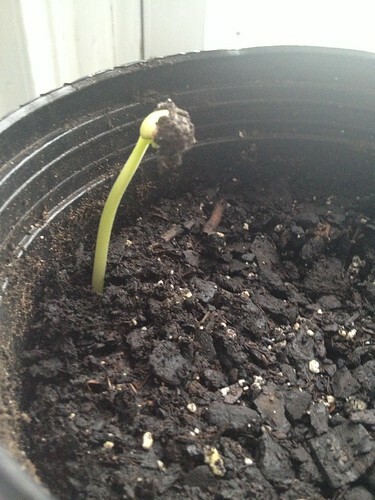 Here's to sprouting seeds!